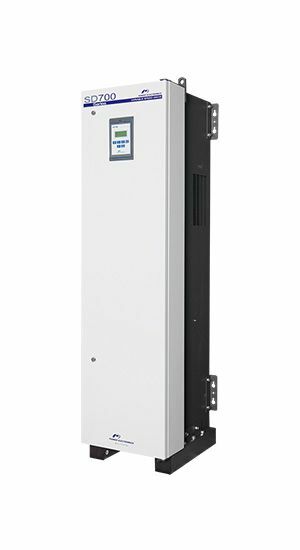 The Variable speed drive SD700 is the core of the SD family, available from 1.2kW to 2000kW, a voltage range from 230VAC to 690VAC and available with up to 24 pulses. IP20 and IP54 mechanical designs cover all general industry applications, making it the most flexible and extensive series. The entire family integrates unique features such as low dV/dt, smart mechanical design and accurate control. There are 11 frames to choose from in order to cover the whole power range. Continuous operation under the most demanding applications ensures a secure investment on new and retrofit projects. The SD700 has also been GL certified allowing for use in Marine applications: Vessels, shuttle tankers, cruise ships and ferries can now take advantage of the greatest features of the SD700 such as flexibility, reliability and low maintenance. Extensive power range. Fully on site tested hardware ensures a perfect performance for small and MW motors. Wide voltage range (230, 380-500, 525 and 690Vac). Suitable for weak electrical grids and variable voltage range operations. IP20 & IP54 Electronics enclosure ensures a long life electronics operation. 12/18/24 Multipulse system selects the best drive that fits with your THDi requirements. Input chokes built-in as standard. Grid anomalies are filtered by efficient input chokes (3% impedance) reducing the THD. Internal and external braking units to dissipate the regenerated energy during braking cycles. Built-in ultrafast fuses (frames 5) protect against unexpected overcurrents. GL certificate. Germanischer Lloyd has certified SD700, assuring your investment in marine projects.